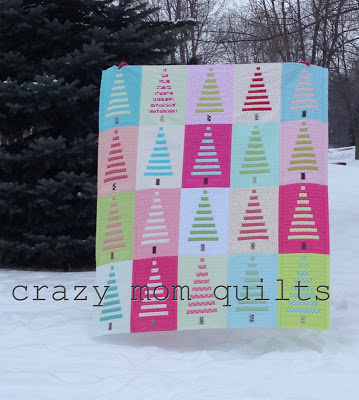 I finished my trees quilt! 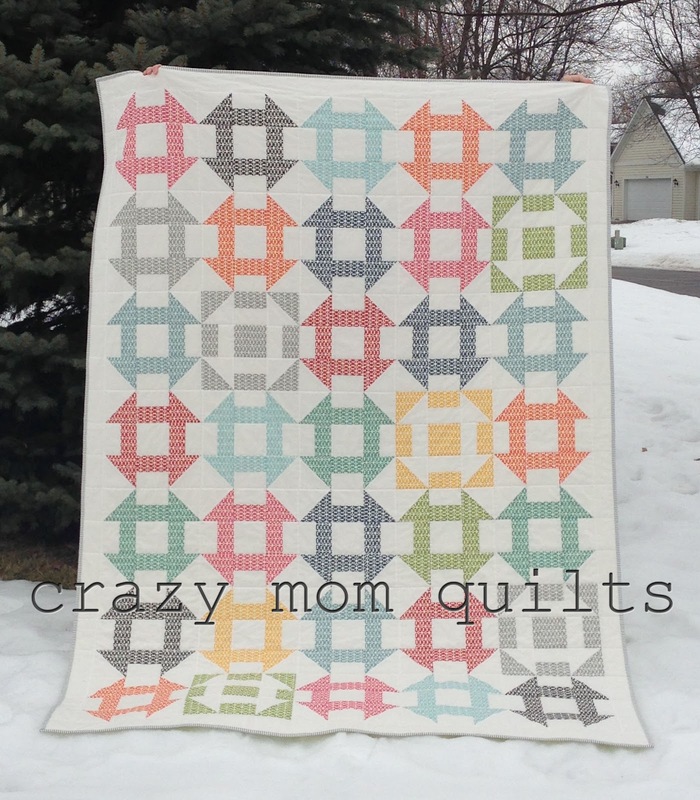 This pattern writing thing isn't a one woman job. I had plenty of help along the way and I'm so grateful! A huge thank you to my neighbor Mary for helping me photograph this thing yesterday in the freezing cold! 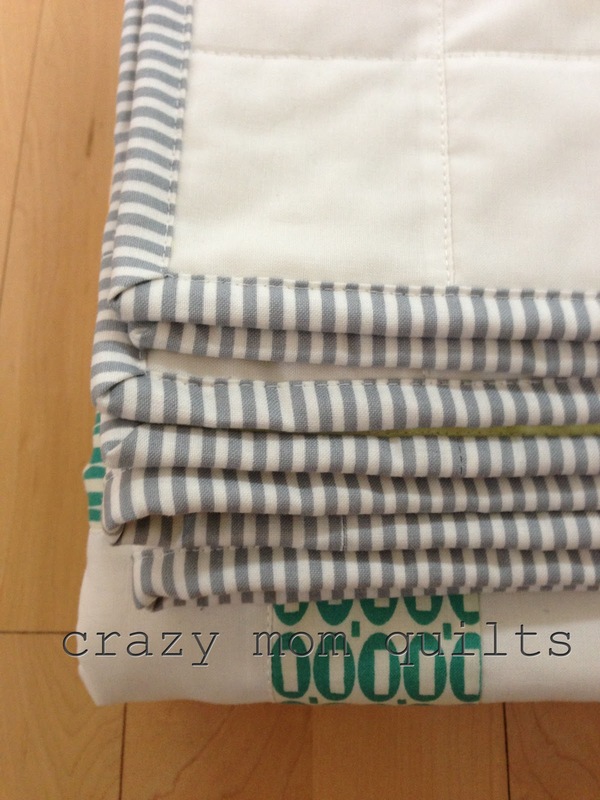 Thank you to Beth for testing the measurements and providing such helpful feedback. Thank you to Tara and Brianne for proofreading. On short notice, too. 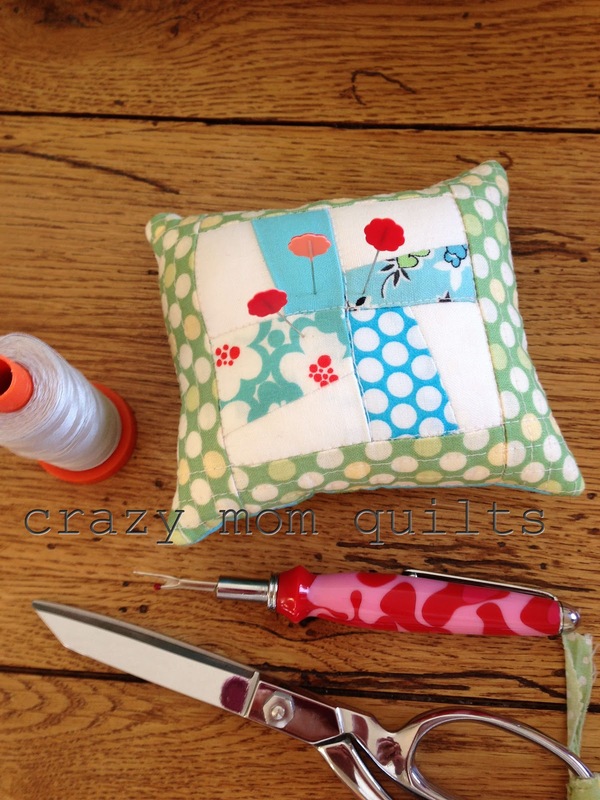 Thank you to Allison for insight and tips on pattern writing and image quality. 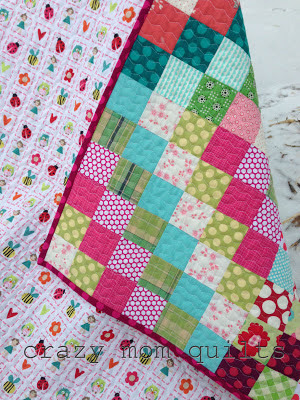 And last but not least, a great big THANKS to all of you for your excitement and positive feedback on this pattern! It kept me going. 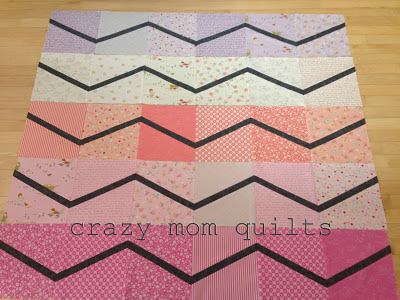 This is a little quilt I'm calling 'lazy zig zag'. Just a few more rows to go! The fabric is a posy layer cake by Moda and a few grey fat quarters. 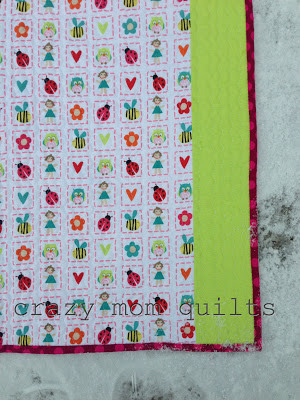 It's fun to be playing with fabric that reminds me of spring. 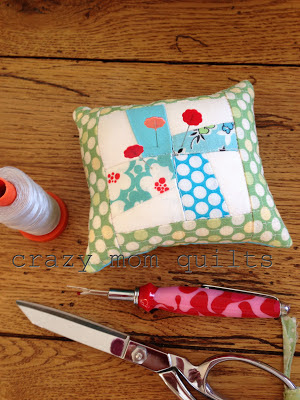 and a little pin cushion making for good measure. Welcome to finish it up Friday! 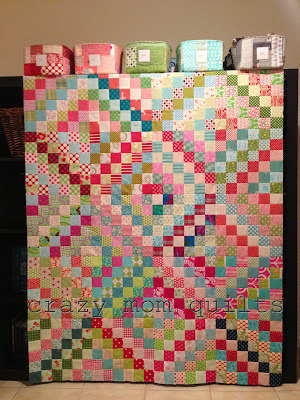 I have no finish to share today, but I survived my uber busy week, so I'm celebrating that accomplishment. Phew! On the Janome Memory Craft 6600 (this is the machine I used at my LQS) I used the #9 stitch. 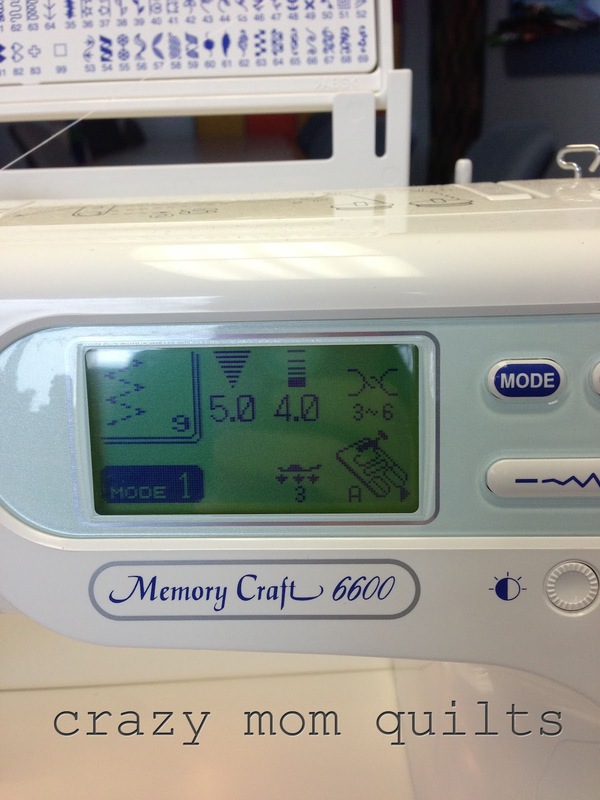 The stitch width is set at 5 and the stitch length set at 4. 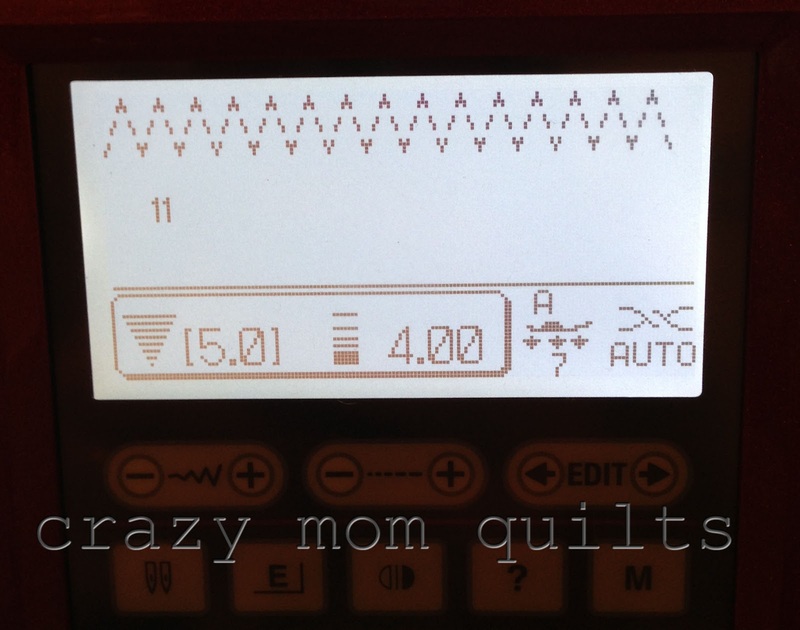 On my Horizon 7700 (sorry for the crummy photo) I used the same settings...except the zig zag stitch is # 11 on this machine rather than #9. 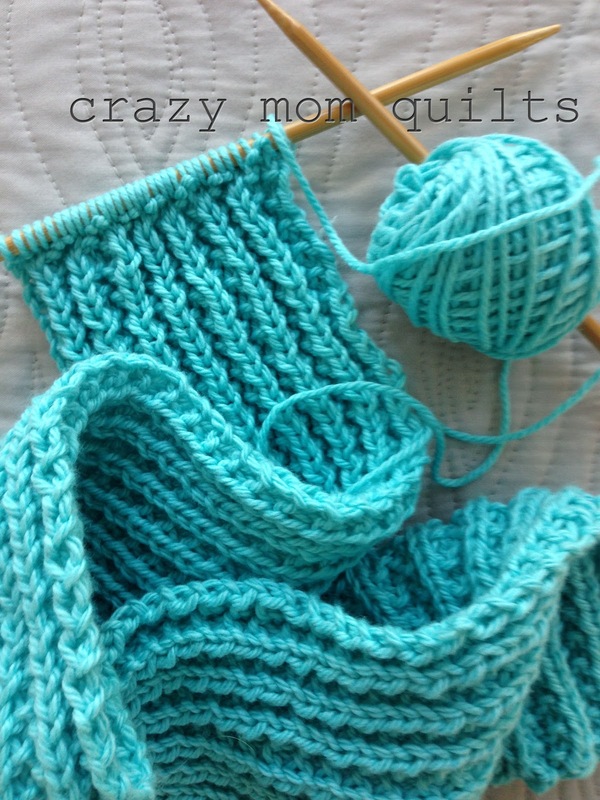 Again, the stitch width is 5 and length is 4. It's a fun way to quilt resulting in a texture that is just fan-tas-tic. I can't wait to finish it up so I can wash and dry it and see what happens. I bet it's soooooo good! How about you? Do you have a finish to share today? If so, please link up. Thanks for joining me for finish it up Friday! A few weeks ago this adorable sock monkey fabric arrived at my local quilt shop. I knew I would find something to use it for. It is just too good to pass up! 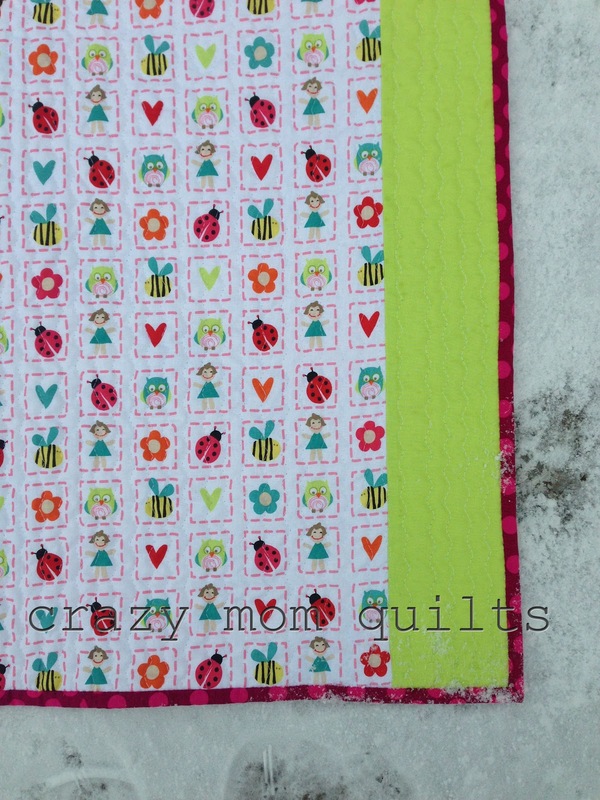 The bottom two super wonderful polka dots are from the Mischief line by Nancy Halvorson. I LOVE them, especially combined with the sock monkeys! I thought my fair and square pattern would be a fitting one for this fabric. It shows off the prints nicely. Plus, I had a complete set of background pieces cut out and just waiting to be used. (For over 2 years!!!) I didn't bother to look at my own tutorial, which is something I should have taken the time to do. 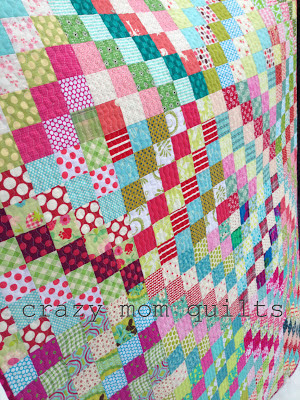 My quilt ended up being 9" too short. Doh! It would have been fine as it was, but after much debate I decided I should go ahead and fix it. 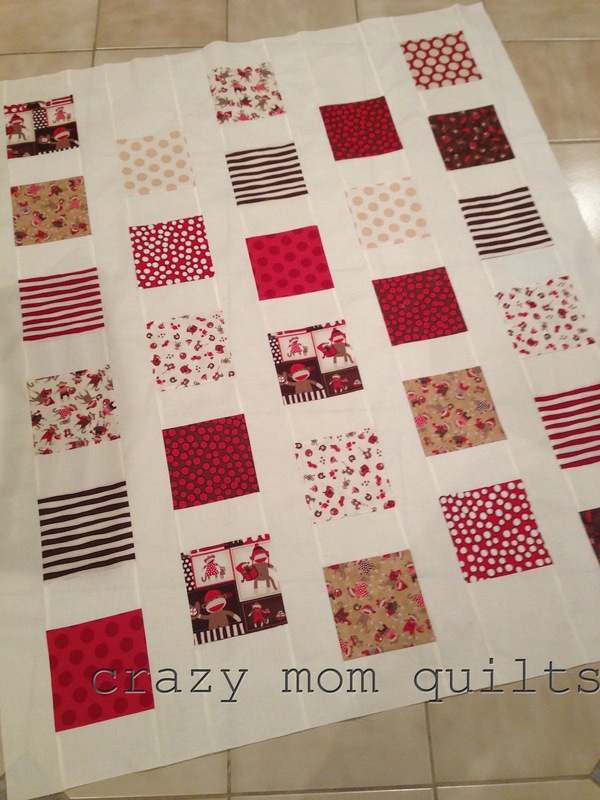 A little stitch ripping and a little adding on and I was done. Again. :) It would have been so much easier to do it right the first time! I finished my scrappy trip quilt top!!! 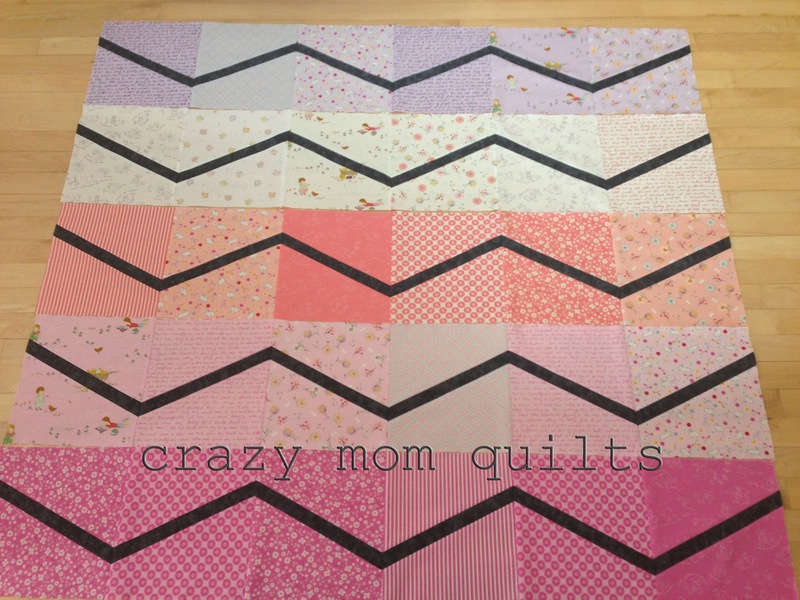 I (only) made 20 blocks, so it measures 48" x 60". I usually prefer larger lap quilts, but at some point you gotta call it a day and move on to the next idea. I love the color scheme I went with. So cheery and fun! 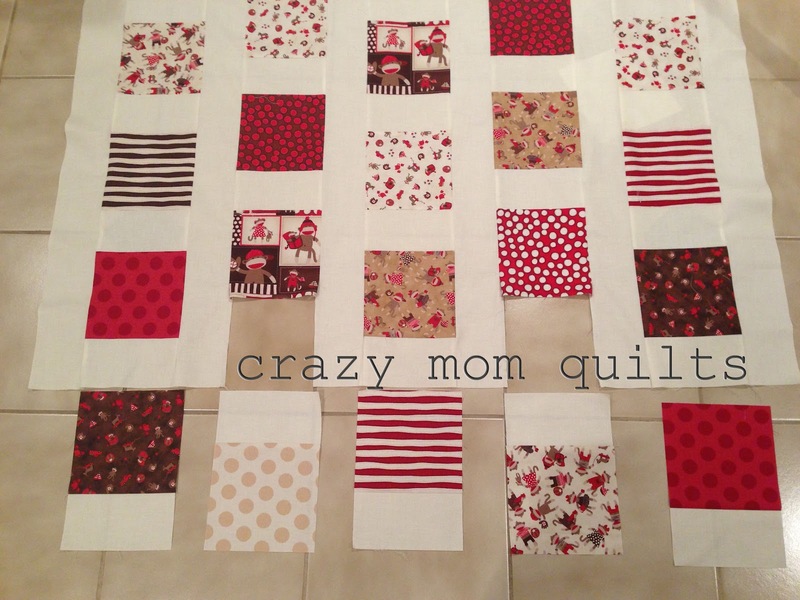 I had a few blocks that were troublesome during the layout process. I thought about scrapping those 2 blocks altogether, but before setting them aside, I thought I should try to rearrange things. I took the block apart (only one seam!) and rearranged the two halves. Lining up all the navy squares in one diagonal line was more pleasing than having them disjointed. 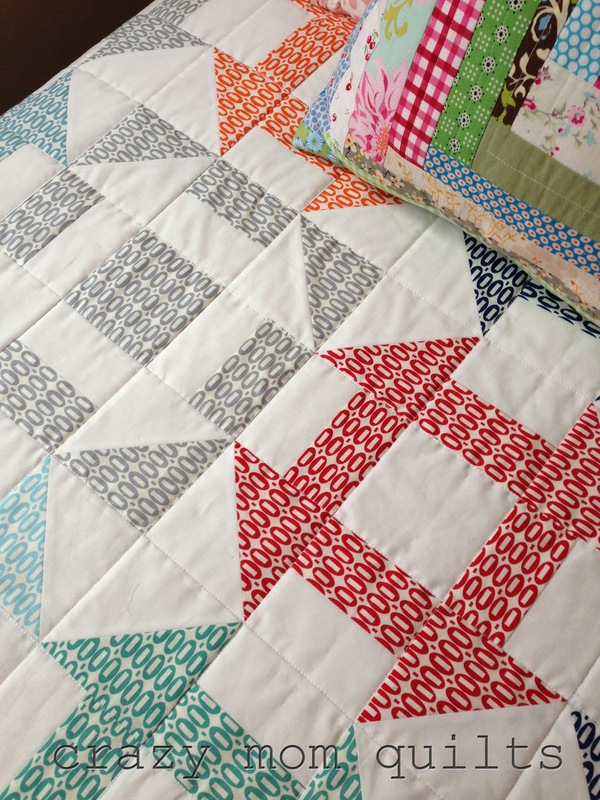 I repaired the other block in a similar fashion and I was able to use both of them after all! Hurray! I even found time to fold up all the leftovers and tuck them back into my stash. It feels great! 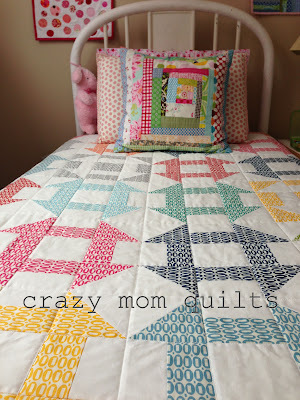 If you are interested in making a quilt similar to this, you can find the tutorial here. Welcome to finish it up Friday. First off, I want to say thanks to all of you who visit here regularly and leave me such sweet comments and encouragement. I appreciate it very much! 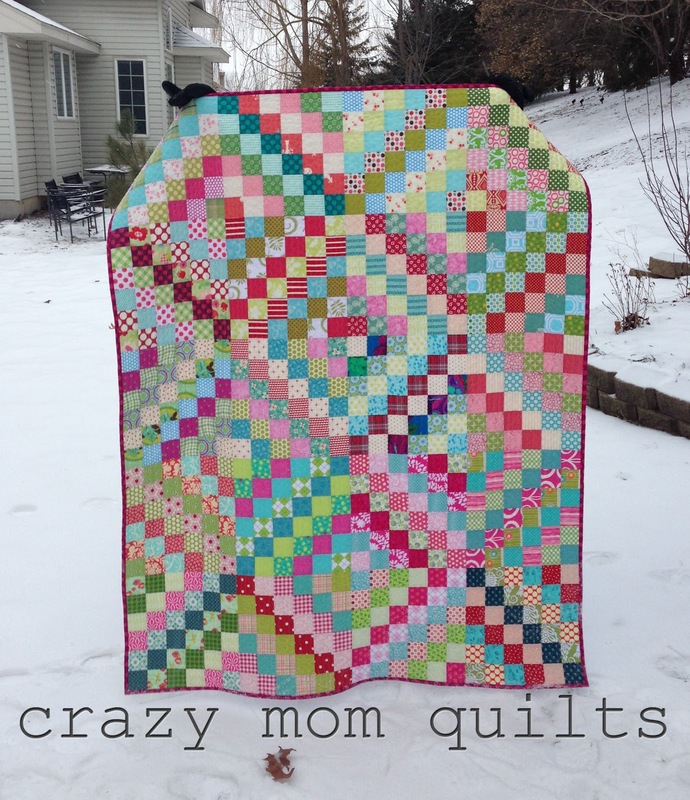 I'm happy to share my completed pezzy quilt with you today! 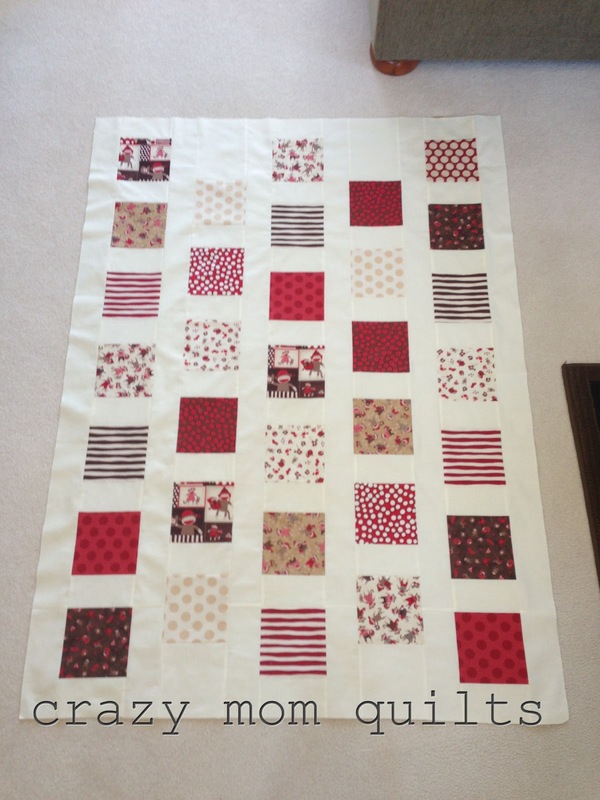 I used a layer cake and 4 yards of white kona cotton for the top-3 yards kona for the blocks and one yard for the outside borders. 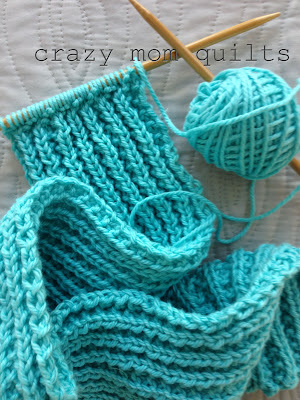 If you are interested, there is a tutorial for a churn dash block here*. The idea/design for this quilt came from my good friend Tara. 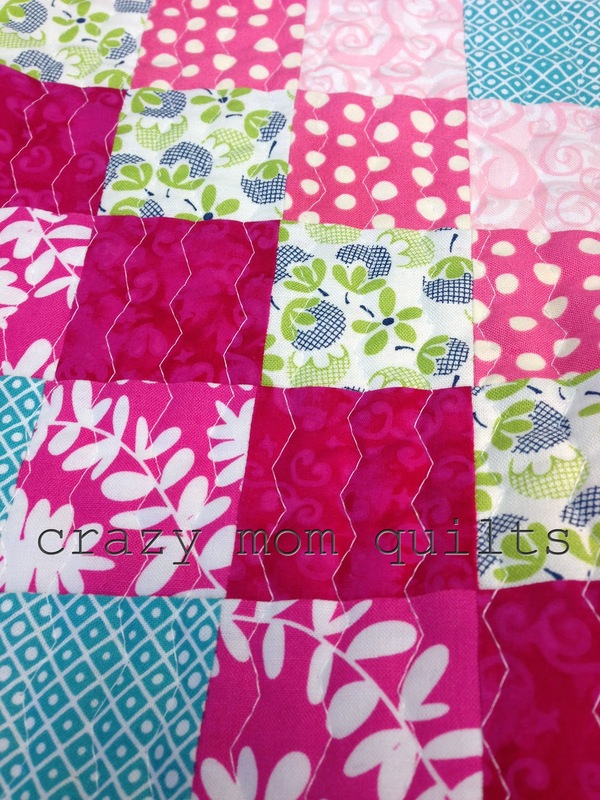 She was gracious to let me copy her, right down to the few reversed blocks. (Thanks Tara!) I love the crisp white fabric with the pezzy print. The colors in this line are so good! 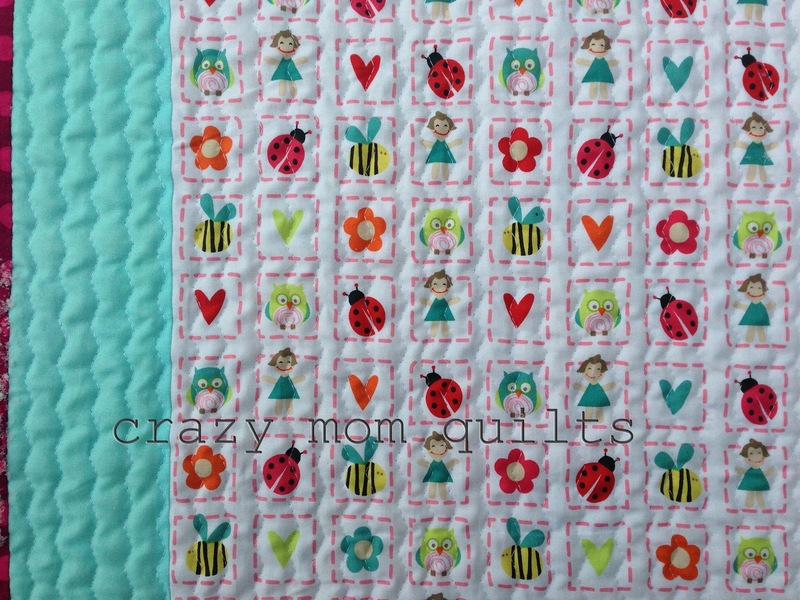 I used a fabulous grey stripe from Connecting Threads for the binding. Sadly, this print is now discontinued. 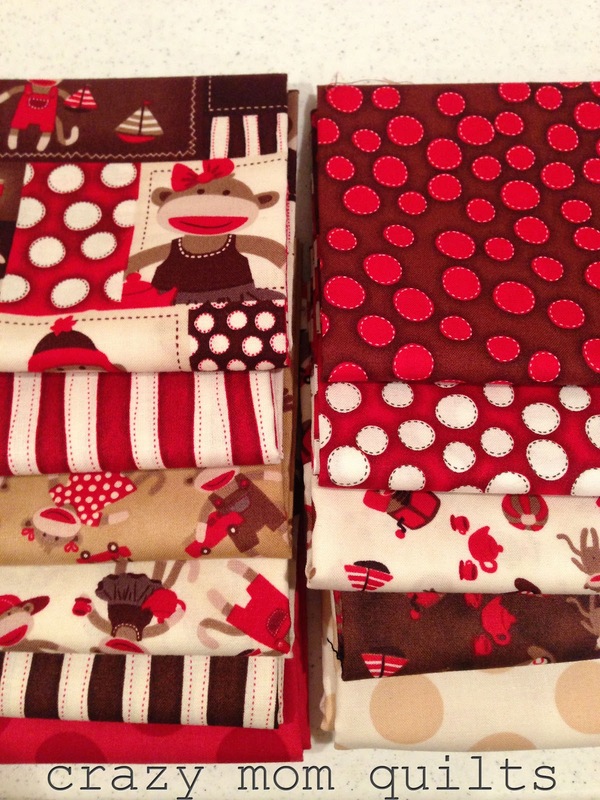 I will be hoarding some of this fabric, to be sure, because it is THE perfect grey. I used a single fabric for the back. Strange choice for me, but sometimes simple=good. 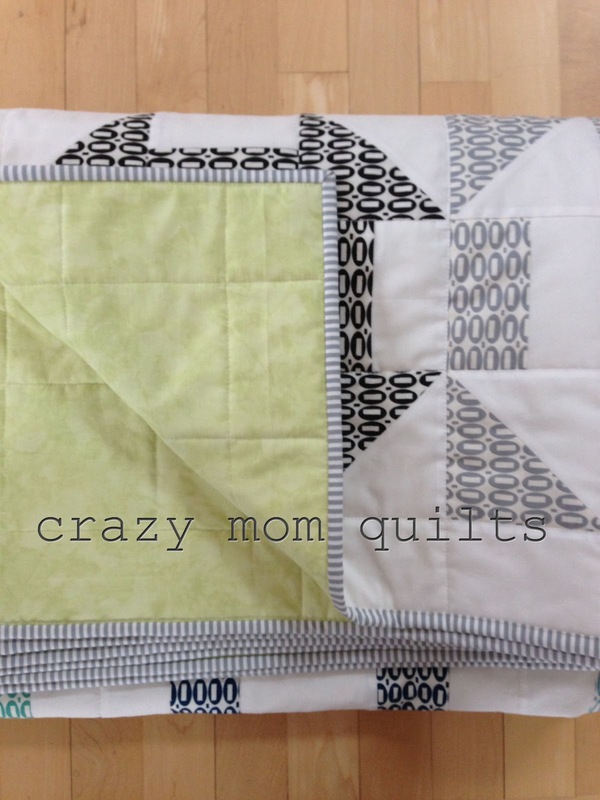 :) The color isn't quite right in the photo...the fabric is really a little bit more limey. It's a lovely almost solid from Michael Miller. 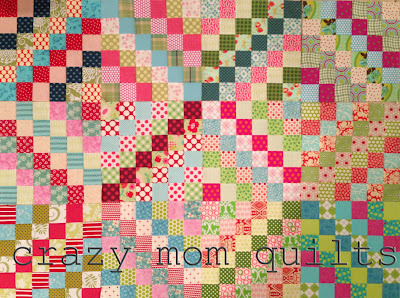 To quilt it I stitched in the ditch. 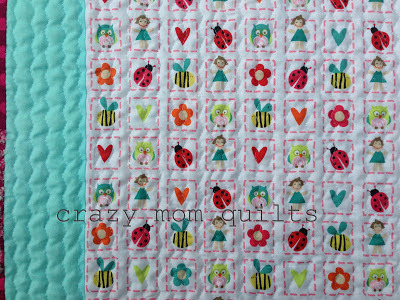 Minimal quilting is a nice change...it keeps the quilt nice and soft and smooshy. And...it's QUICK! I quilted this in one afternoon! The quilt measures 64" x 88 1/2". 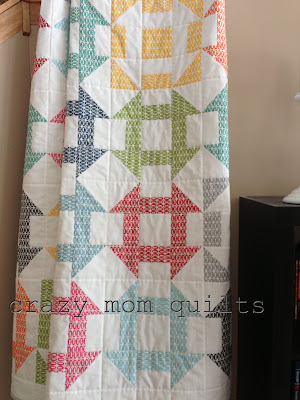 Perfect for a twin bed or a nice big lap quilt. I'm quite pleased with this finish! I've even got a label on it and it's ready for gifting. Finishing feels soooooooooo good!!!! *the only thing I did differently from the churn dash tutorial was cut the corner blocks at 5" rather than 4 7/8". 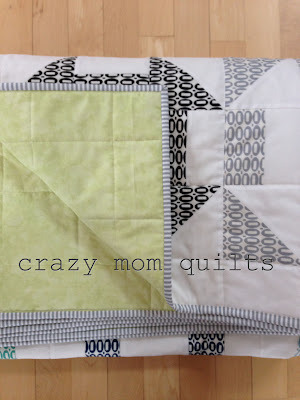 I trimmed the pieced triangle units to 4.5". Cutting squares 5" is so much easier than cutting squares 4 7/8", and trimming helps accuracy immensely. Now it's your turn! Please link up your finishes and go visit a few (or more) other finishers and cheer them on. Thanks for joining me each week for finish it up Friday! 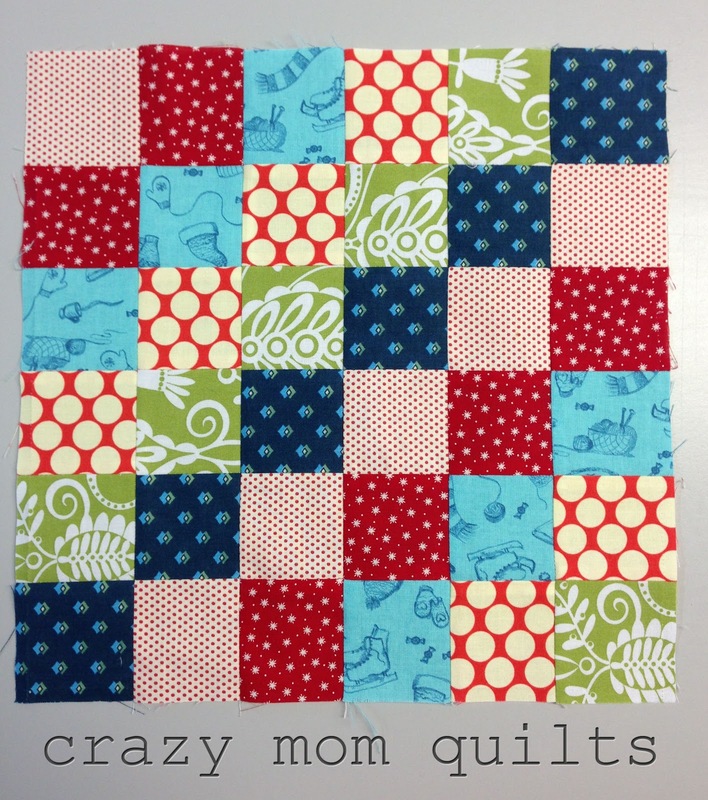 I finished my 20th block for my scrappy trip along. 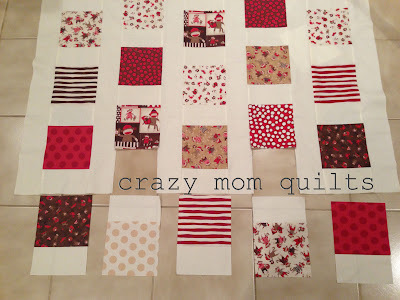 Today's goal is to try to get the blocks into a quilt top. 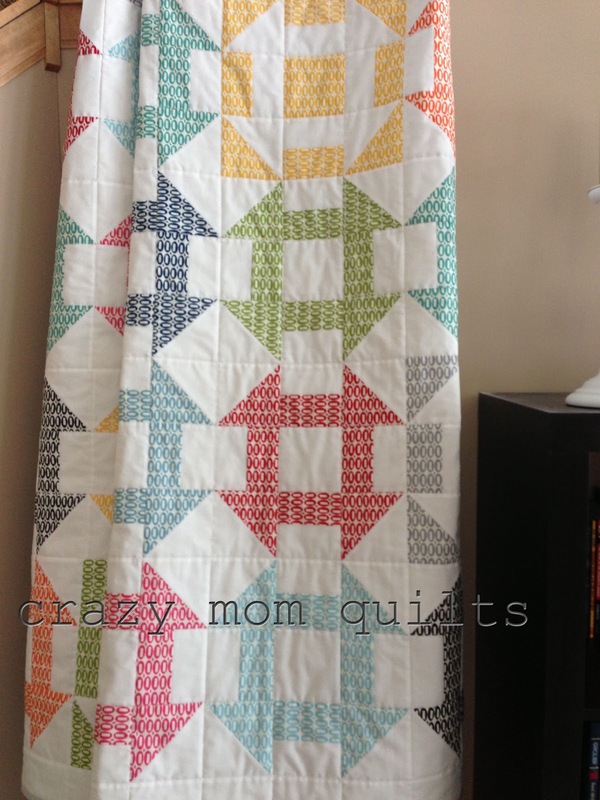 I enjoyed making this quilt very much. 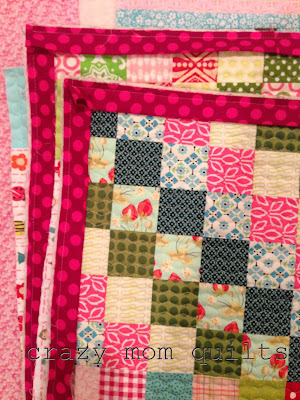 I must like it an awful lot...I cut into my Ruby and Flea Market Fancy fabric, after all! It just so happens that my quilt matches a knit hat that I'm working on. Love it when that happens! 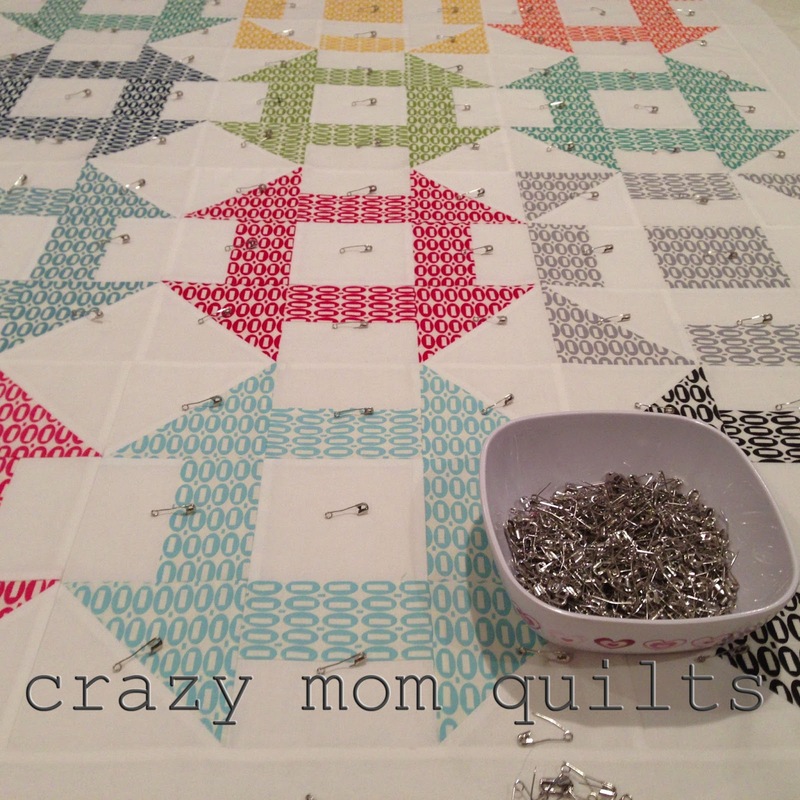 And this is what the aftermath of a scrappy trip quilt looks like. 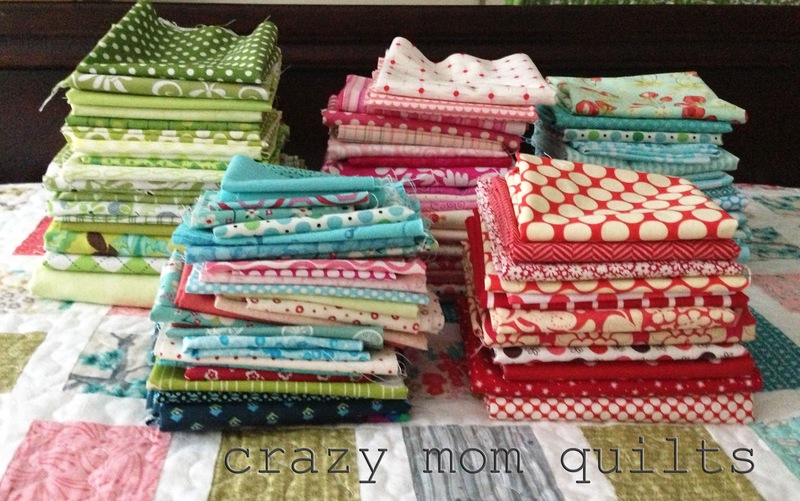 I have lots of folding to do. 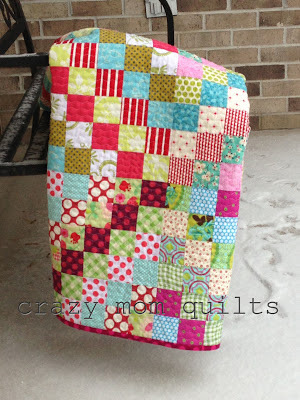 I used 120 different fabrics for this quilt! 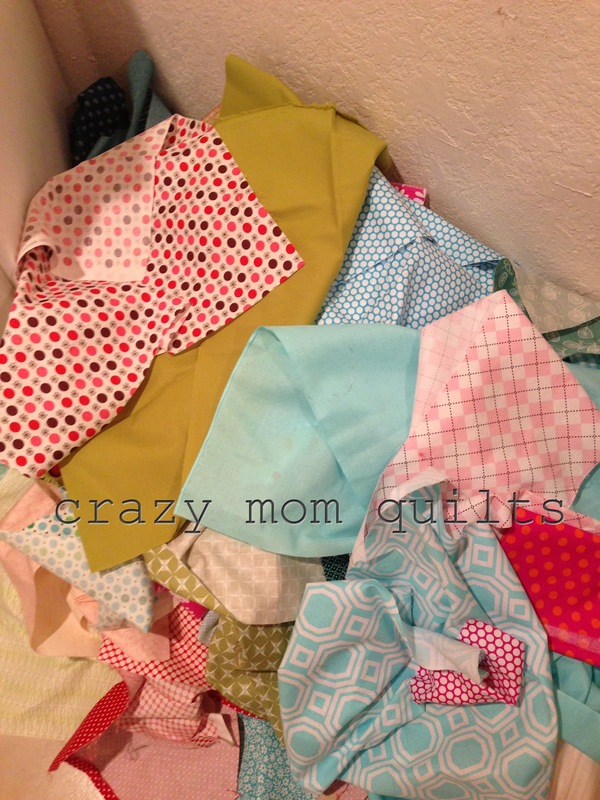 Maybe while I'm at the task of folding my fabric, I'll get to my laundry, too? One can hope! 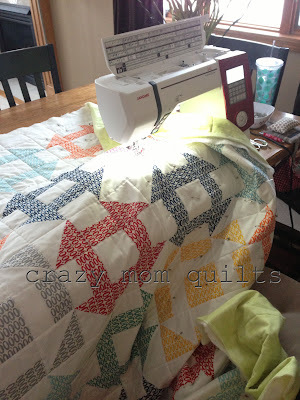 Today I pulled out my pezzy quilt and got busy basting. ...when it reality it was only last month. Long enough! 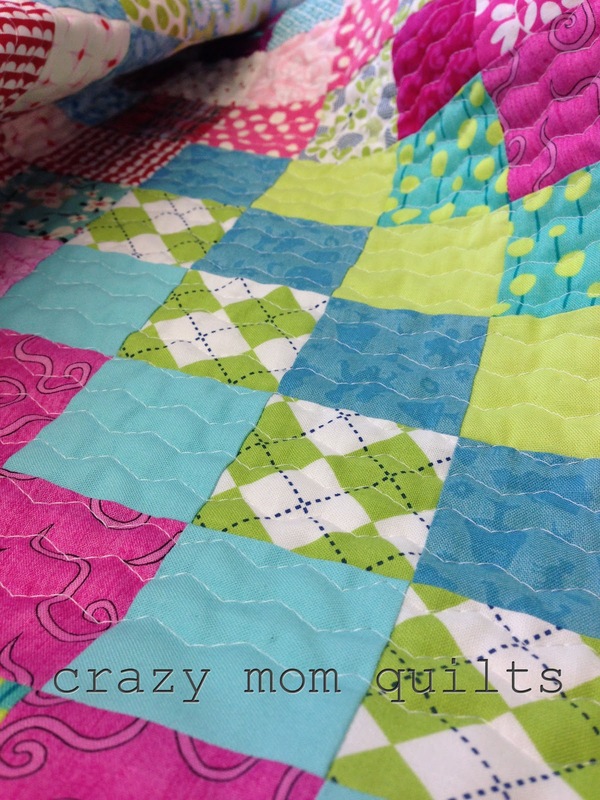 It feels good-so good-to be quilting! 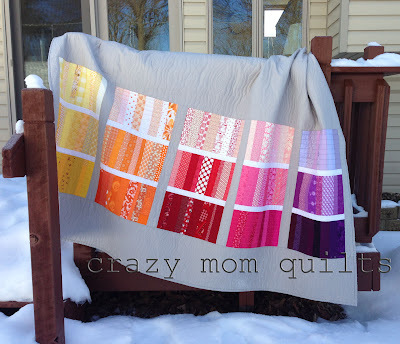 Thankfully things went well and I should be binding before you know it! Here we are, 6 days into the new year and I'm finally getting around to writing my New Years post. It's quite indicative of where I'm at these days. This past year was a BIG one! Oh mylanta! -Sunday Morning Quilts was released, officially making me an author. -I did a bunch of speaking and teaching. 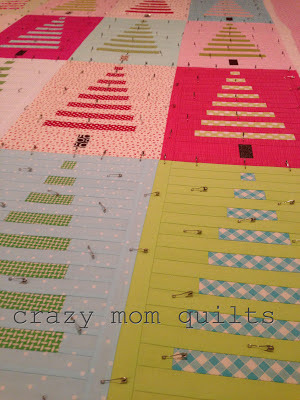 -I attended quilt market in Kansas City. -I got to meet Denyse Schmidt. -My husband took a new job. -My younger son got braces. -My older son started middle school. 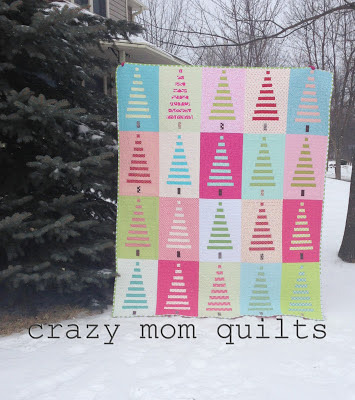 -I started working at my local quilt shop. -We finally decorated our house the way we wanted. -We put our house up for sale. 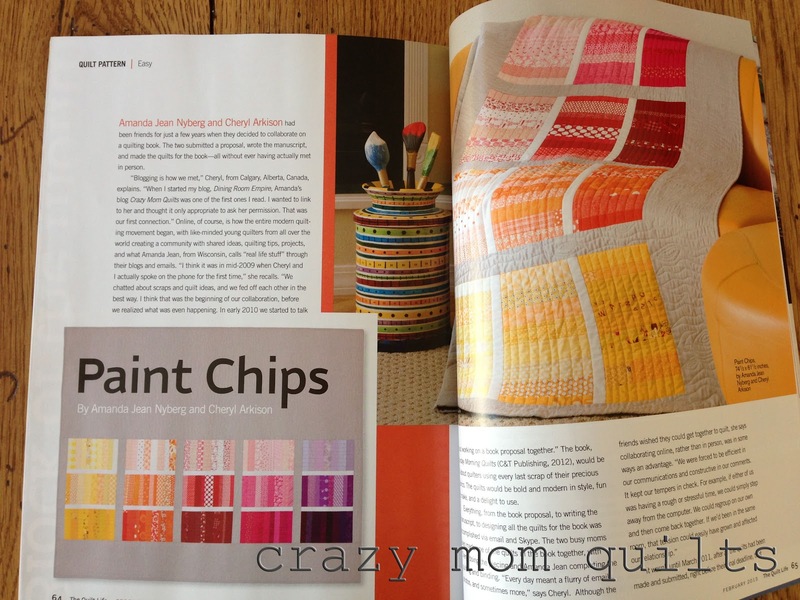 -I had one of my quilts featured on the cover of a magazine. -I celebrated my 6 year blogging anniversary. Wow. That's an awful lot. I had a list of goals for last year. I think I did pretty well with them. 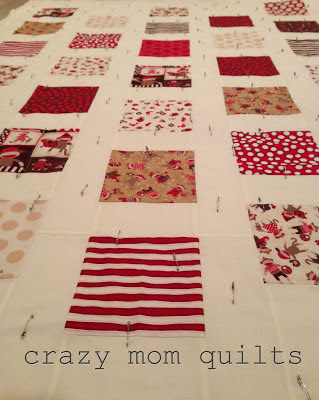 -I finished a total of 21 quilts, which is quite moderate for me. 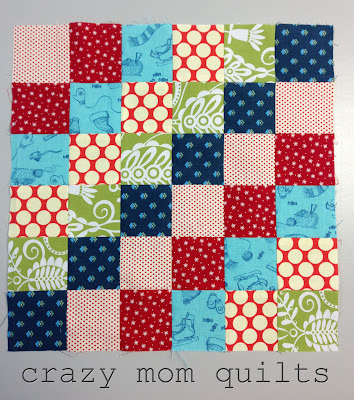 I definitely did quilt with more intention and did less 'just because' quilting. Success! -I wanted to make a dent in the stash. Hmmm. I'm not sure that happened, but I didn't lose a ton of ground either. No loss, no obvious gain. (Or perhaps oblivious gain? ha!) Whichever one it is, I'm feeling ok about where I'm at. -Scraps under control? It's all relative, but not too bad. I did pass along scraps several times, which felt good. I even threw some away. (gasp!! Did I just admit that?) I'd proclaim this goal a success as well. -We decorated our house and got it to a point where it felt like ours so we could turn around and put it on the market. Isn't that always the way? (It's no coincidence whatsoever that these went hand in hand.) It was a ridiculous amount of work. When adding this goal to the list last year I really doubted it would happen. If fact, I would have bet money that it wouldn't! But, with a deadline it's amazing what you can accomplish. -Overall, I hoped to be more intentional with how I lived my life and I think I did. This is an on-going goal, no doubt. 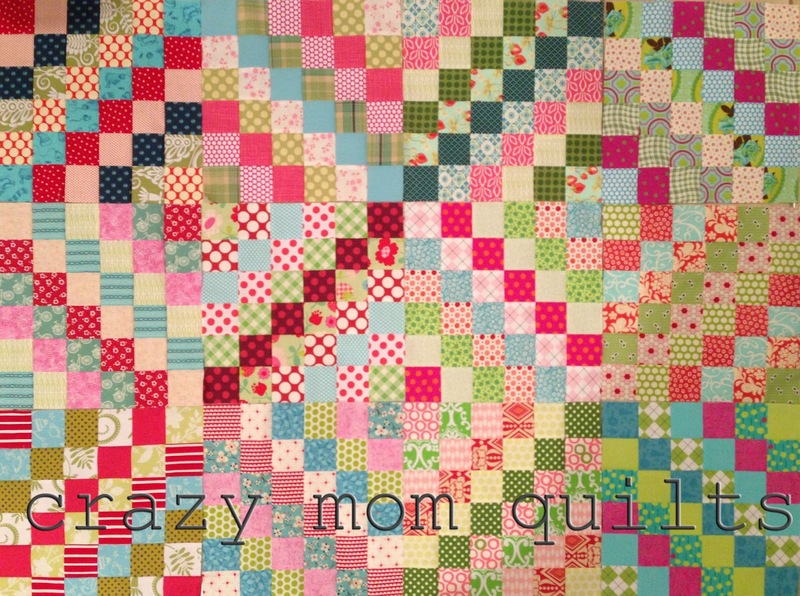 -I would like to get better at giving my quilts away. 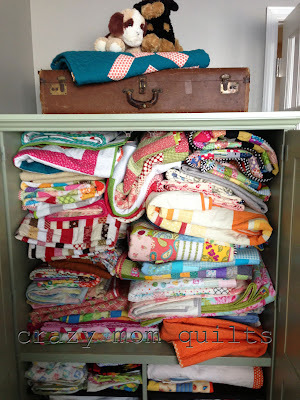 The old quilt cupboard is full again. What a great problem to have, right? 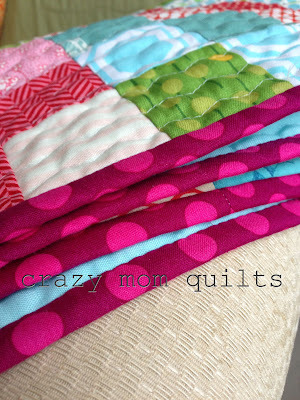 -I plan to host a quilt along (or two). It's been too long and I miss it! -I have a fun idea for a blog series I'd like to start. 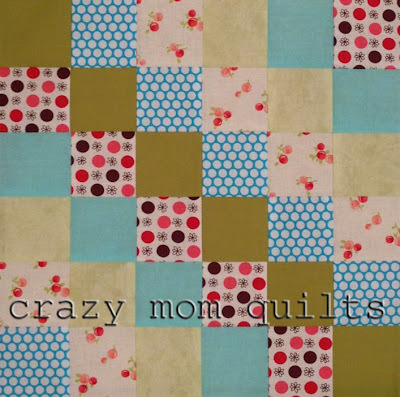 -I hope to get my act together and teach an online quilting class. And, not so much a goal...but I really, really hope we sell our house. Soon. Here's to a terrific 2013! I jumped on the scrappy trip bandwagon. 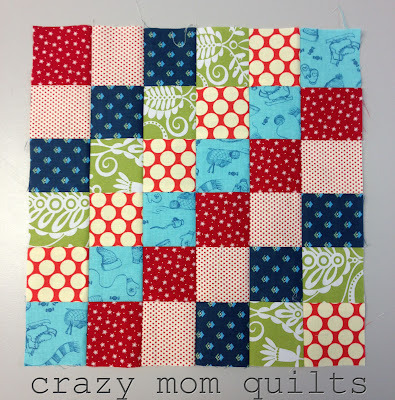 They are 2" finished squares, after all. 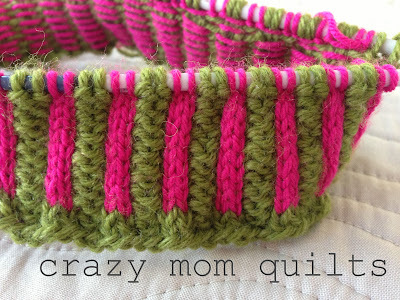 I'm using my chopped rhubarb fabric pull. edited to add: there is a pattern for the paint chips quilt included in the article, if you would care to make one of your very own. How about you? If you have a finish to share, please link up! Hope you have a fabulous Friday! 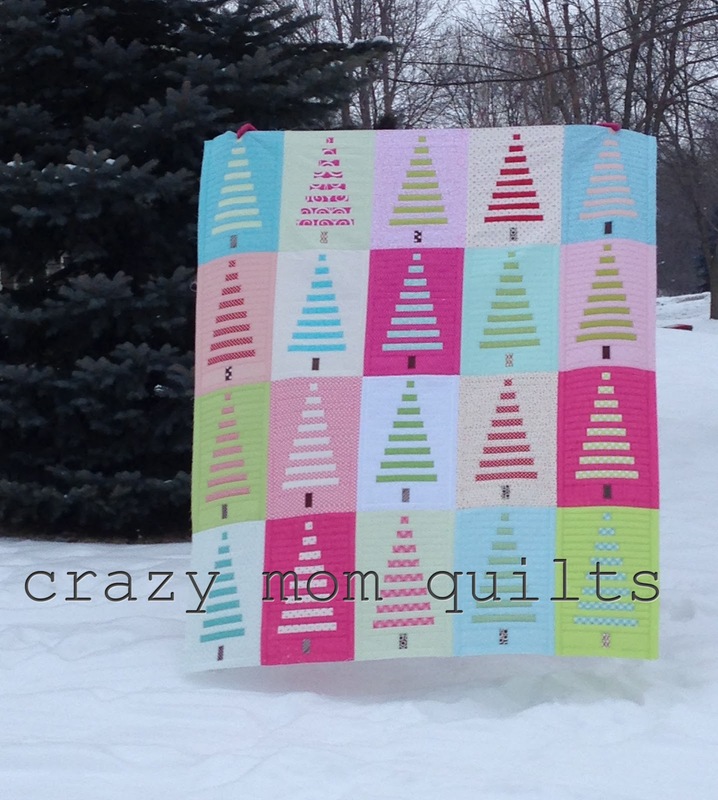 I finally finished my trees quilt top!!!!!!!! !